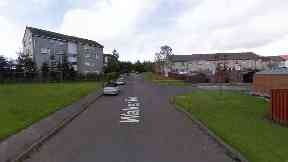 A man was taken to hospital with facial injuries after he was attacked while asleep in West Lothian. The 32-year-old victim was assaulted with a weapon just before 2am on Friday morning within a property in Walker Road, Fauldhouse. He was then taken to Wishaw General Hospital in North Lanarkshire for treatment. Police are now investigating the incident and are not ruling out that it may have been a targeted attack. Detective constable Tony Gilhooley said: "We are appealing to anyone who may have seen anything unusual or suspicious in the area including any unknown vehicles around the time this incident happened to contact us. "This type of crime is rare for the area and one line of enquiry we are following is that this was a targeted incident. "There will be an increased police presence in the area while we carry out enquiries and anyone with information is asked to contact police." If you have any information, call 101 or Crimestoppers 0800 555 111.